After the third Toji Isao Takahashi had resigned the Toji and assumed brewing counsellor, Noboru Minagawa assumed the Fourth Toji of Takashimizu head office brewery. Minagawa came from Nakasen, current Daisen city. Minagawa entered the company as a seasonal worker in 1962 when he was 19 years old. He assumed a chief of Shubo in 1986 and Moromi in 1991. After the transfer from head office brewery to Nakasen brewery in 1995, he assumed a deputy Toji, and in 1998, he was appointed to Toji of Nakasen. He finally worked as Toji of head office brewery from 1998 to 2014. His years of experience in sake brewing covered 52 years and it was especially quite long career among other brewers. Minagawa consistently studied his own brewing method hard and improved his skill even after the assumption of Toji, while absorbing his predecessor’s techniques. When he was Toji of Nakasen, he was so passionate about sake brewing that he did whole process of ginjo brewing by himself. After the assumption of Toji of head office brewery, he did the works at every important point of his own accord while he left each brewing process to other brewers. By taking the initiative in working, he showed his own skill to brewers. 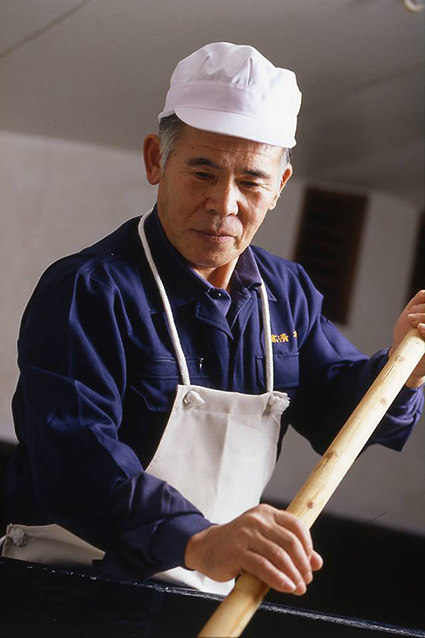 He was a gentle person, but on the other hand, hard and dedicated worker, and faced sake brewing honestly day by day. As a result of carrying through with his belief and style in sake brewing, he received prizes at various competitions including the Annual Japan New Sake Awards. The number of prizes he won at the Annual Japan New Sake Awards counts 11 times, and in 2013, he was commended as a “superior-skilled worker in Akita prefecture”. His effort and belief bore fruits as his “sake loved by men and women of all ages” and honorable winning prizes.